New big carbon fiber flute! The first of my two new flutes has arrived from Carbony Celtic Winds! This is the bigger one in D, since they aren’t going to send me the fife in D until next month. But that’s TOTALLY okay, since this one will be fun to play with until then. 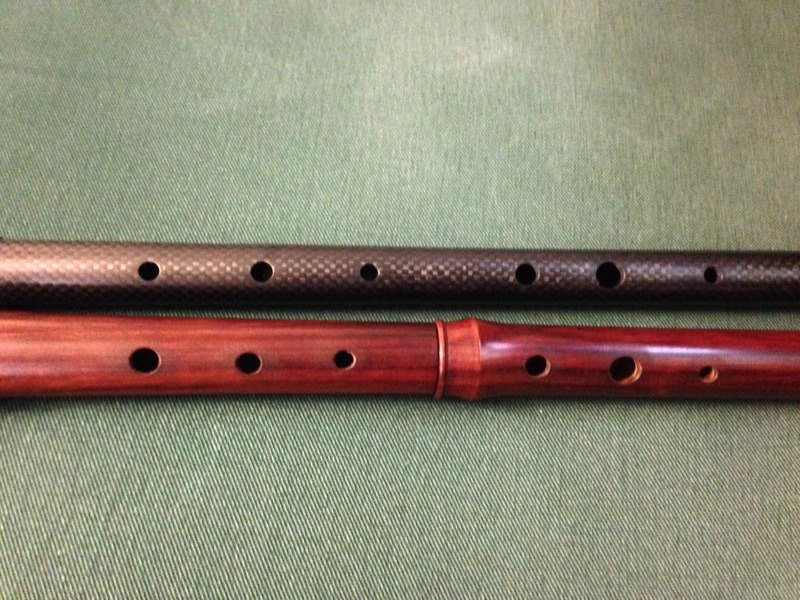 The new flute is just about 23 inches in length, about 58.4 centimeters–just a scooch longer than Norouet, my wooden flute in D. I can’t weigh them both but unsurprisingly, the carbon fiber one feels slightly lighter than Norouet does. Norouet has a slightly wider inner diameter, at just over half an inch; new!flute is just about half an inch. However, and this is a big however–the spacing on the holes, at least for my left hand, is a bit wider than I’m used to. Not out of the question, but it’s a bit of a stretch; I’m going to play around with it for a few more days and see whether I can comfortably play this instrument. But there are concerns here, I think. I’m okay on this instrument if I try to play something slow, like, say, “La Fée des Dents”. But if I go to something fast, like “Manteau d’hiver”, I start missing holes because I have to stretch to hit them and my hand may not be able to do that for long. This will require some experimentation. The nice gentleman at Carbony who acknowledged my order in email says that they have another model in D with holes slightly closer together, but which sacrifices a bit of power. So worst case scenario is, I send this one back and he sends me the replacement when he sends me up the fife. Check out the hole spacing in this comparison pic. This is the new carbon fiber next to Norouet. This is, I suppose, the risk I take when ordering instruments online–I couldn’t have handled this particular flute beforehand, so I had no way of knowing until it got here if I was going to be able to play it. But hopefully this will be a solvable problem. I’ve sent the above pic to the guy at Carbony and asked him to tell me what the hole spacing is like on the other D model they have. It’d be a shame to lose power but that’s an acceptable tradeoff if it means I don’t risk my hand cramping up when I’m trying to play.